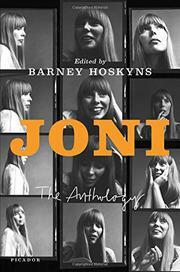 A patchwork collection of writing spanning Joni Mitchell’s legendary career. Veteran British music journalist Hoskyns (Lowside of the Road: A Life of Tom Waits, 2009, etc. ), co-founder and editorial director of the online library Rock’s Backpages, compiles a wide range of journalism about the Canadian-born singer/songwriter, visual artist, and cultural icon. As the editor writes in the introduction, she is “peerless and untouchable as a singer-songwriter of intricate lyrics and swoopingly beautiful melodies.” Hoskyns works with a light touch, serving more as a curator than editor (though he includes a couple of his own pieces) in this chronological path through Mitchell’s long, respected, but sometimes-bumpy life and career. The pieces run a wide range: reviews of albums and performances, essays and profiles, interviews and features, and even some ad copy. Due to Hoskyns’ British roots, the selections show a nice trans-Atlantic bent. However, they are drawn from a somewhat narrow range of publications and feature a roughly 4-to-1 male-to-female ratio of contributors, almost all of whom are white. As with any such anthology, the quality varies. There are some quite excellent contributions and some really lousy ones, but in the aggregate, they provide a strong sense of the artistic, intellectual, and personal development of someone who has always chafed at being branded a folk singer and who grew frustrated with the recording industry and critical reception of much of her work after her late-1960s-to-mid-’70s heyday. Those who choose to read from beginning to end will find a lot of repetition; this is the sort of collection that lends itself to dipping in and out of. The book inevitably creates a desire to hear Mitchell’s music and perhaps try to track down some of her artwork, which at the end of the day are the reason the book exists in the first place.